Living Science Solutions for Class 8 Science Chapter 8 Cell Structure And Functions are provided here with simple step-by-step explanations. These solutions for Cell Structure And Functions are extremely popular among class 8 students for Science Cell Structure And Functions Solutions come handy for quickly completing your homework and preparing for exams. All questions and answers from the Living Science Book of class 8 Science Chapter 8 are provided here for you for free. You will also love the ad-free experience on Meritnation’s Living Science Solutions. All Living Science Solutions for class 8 Science are prepared by experts and are 100% accurate. Which of these is multicellular? Multicellular means made of more than one cells. Mushroom is a multicellular organism. All the other organisms mentioned here, are unicellular. The egg of a hen is a cell. It divides repeatedly and differentiates into various tissues to develop into a chicken. Which of these is not present in an animal cell? In an animal cell, chloroplasts are not present. Chloroplasts are present in green plants and serve as the sites of photosynthesis in plants. Which of these is the control centre of the cell? The control centre of the cell is nucleus. The nucleus contains chromosomes, which divide during cell division. Which organelles are responsible for energy production in a cell? Mitochondria is responsible for energy production in a cell. Which of these is not stated by the cell theory? (a) Cells are the basic structural units of living organisms. (b) All cells are identical. (c) New cells are formed due to division in old cells. (d) The way an organism functions depends on the way the cells work. Cell theory states that all cells are similar in their basic structure and function but not identical. In which of these does a single cell NOT perform all life functions? Mosquito is a multicellular organism where different organs perform different functions. Which of these unicellular organisms has no definite shape? Amoeba is an unicellular organism that has no definite shape. It keeps changing its shape. What are the lower levels of organization in a multicellular organism? Are these levels also present in unicellular organisms? These levels are not present in unicellular organisms because their body is made up of a single cell. Draw a labelled diagram to show the general structure of a cell. What are the differences between plant and animal cells? Cell wall is present. Cell wall is absent. Plastids are found in plant cell. Plastids are absent in animal cell. A mature plant cell has a large central vacuole. 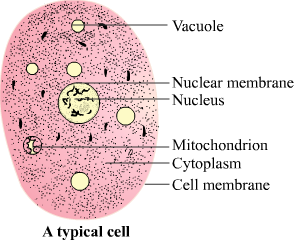 An animal cell has many small vacuoles. What is meant by the term 'cell division'? Why is cell division necessary? Cell division is the process of formation of new cells from parent cells. Cell division is necessary for the growth and development of a multicellular organism because new cells are needed to replace the old and dead cells. A tissue is a group of one or more type of cells and their intercellular substance that performs a particular function. Organelles are organised cell components present in the cytoplasm. Each organelle has a specific function to perform inside the cell. Examples: Ribosomes, mitochondria, vacuoles, etc. Which of these has a cell wall−Plant cell or animal cell? Plant cell has a cell wall, which gives shape and rigidity to the cells of a plant. Name the process by which new cells are formed. Cell division is the process by which new cells are formed. Which structure in the nucleus is a storehouse for information needed by the cell to function? Chromosomes present in the nucleus act as a storehouse for information needed by the cell to function. Plant cells have large vacuoles as compared to animal cells. True or false? In mature plant cells, the small vacuoles fuse to form a single large central vacuole that occupies up to 90% of the volume of the cell. In animal cells, vacuoles are usually small in size. White blood cells (WBC) can squeeze through walls of blood vessels and get into intercellular spaces to fight against germs. Which property of WBCs allows them to do this? White blood cells like Amoeba can change their shape. This property allows them to squeeze through the walls of blood vessels and get into intercellular spaces to fight against germs. Why do plant cells need a cell wall, and animal cells do not? Plant cells, unlike animals, do not have skeleton to support them. Therefore, they need a cell wall, which provides support and protection to them. Why do you think parents and doctors get very worried if a child gets a head or spinal injury? Spinal injury results in destruction of nerve cells. Since, nerve cells cannot be replaced if they are once destroyed, doctors and parents get worried if a child gets a head or spinal injury. Living things are made up of cells while non-living things are made up of atoms and molecules. Do you agree? Give reasons. Yes, I agree with the statement. Non-living things cannot reproduce on their own, do not respire and cannot move because they are made up of atoms and molecules. Living things respire, reproduce and move because they are made up of cells, which are the basis of life.